At the conclusion of the 2018 DIII gymnastics season, we saw the final routines of many top gymnasts. After four years of these talented competitors dominating the podium, it will be fun to see who will rise up and take their place in the headlines and hearts of DIII fans around the country. Here are seven names and routines we think you should keep an eye out for this season. This back-to-back national bar champion’s gymnastics will take your breath away. Baylee has a difficult bar combination that many in DI don’t even attempt—Tkatchev to pak—and tops it off with a beautiful, straight-bodied double layout dismount. Though recognized for her bar work, Tkaczuk is also stellar on beam and competes a jam-packed routine that is riddled with difficulty and ALL the aerials (seriously though, check it out). As just an incoming junior, Baylee still has two more years of being the bar worker to beat… However, we wouldn’t be mad if this champ could make it a four-peat. DIII is always thrilling to watch because many of the gymnasts do a lot of unique skills and combinations to increase their start values, and Nichols is no exception. She does a super unique handspring + handspring + front, and it is simply *heart eyes emoji*. In 2017, she received a 9.650 in event finals, which helped her tie for third. With the consistency she showed last season, we are certain she’ll give everyone a run for their money in 2019. Elegant dancing, powerful tumbling, unwavering emotion-—you name it, and Jordan’s got it. 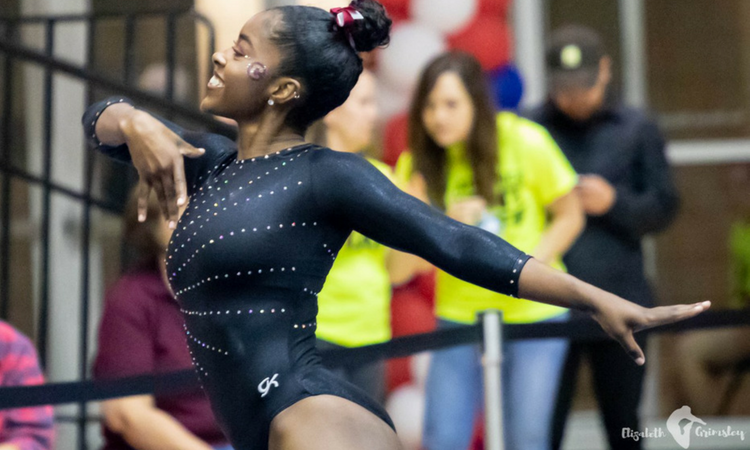 In 2018, Jordan scored a 9.875 in event finals at the USA Gymnastics Collegiate National Championships. This score was good enough for fourth place, which was an incredible finish considering she was competing against DI and II gymnasts in the field. Her second pass—front lay + front lay half + split jump + punch front—is what really helps her shine and is typically executed and controlled beautifully. A rising senior, Barmore is an incredible all around gymnast who, right off the bat freshman year, placed fourth in the all around at nationals and tied for first on bars. She has competed unique skills on many of the events, including a Comaneci on bars and an aerial + back full dismount off beam. However, vault is where she really shines, showcasing one of the only 9.950 start values in the entire division. This proved to be a huge asset at nationals this year where she won the 2018 national vault title with a 9.825. Check out her awesome Yurchenko full-on tuck off. It is incredibly difficult to choose just one of her routines to highlight. Kowalik is FANTASTIC on every event she competes (vault, beam, and floor) and has qualified for event finals on all three events for the past three years. In 2018, she place in the top three on everything, and in the two years before that, she was back-to-back beam national champion. As a senior this year, look for her to continue leading the Golden Eagles to many victories throughout the season…and maybe even a national title. How could we leave the reigning back-to-back national all around champ off this list?! When it comes to O’Donnell, each routine is better than the next, typically capping off her day with a huge floor score. She competes a front double full for her first pass, which isn’t super common in DIII gymnastics, so it’s always fun when someone switches it up a bit—and with difficulty to boot! Combine her tumbling with some sassy music and choreography, and you’ve got quite the entertaining routine. Watch O’Donnell continue to dominate next year as she has a legitimate shot at receiving All-America honors on at least three events and the all around. As a freshman in 2018, Schulz tied the school record (9.825) on beam in, get this, the season home opener! What a way to come out with a bang and let the home crowd know who you are. Though she doesn’t do anything incredibly difficult, she works the beam confidently and precisely, which allowed her to secure a 9.750 in event finals at nationals—a score good enough to tie for third. She’s also a great floor worker and never scored below a 9.475 the entire season. Watch out for her this year, as she has a shot at being a national podium finisher on both the aforementioned events. There are so many other routines and gymnasts that we can’t wait to see again next year! What routines are you all especially excited to watch? Who do you think will make a name for themselves in 2019? Like what you see? Consider donating to support out efforts throughout the year!